I have been in the Philippines for four weeks now and can't believe that the half of outreach is already here. God is continuing to do amazing things in and through our team and we are constantly finding ourselves gripped with His love for the people here. We began our adventures on an island South of Manila, called Palawan. It's blue waters and vivid green landscape were quite a contrast to the business of the city we had just seen. 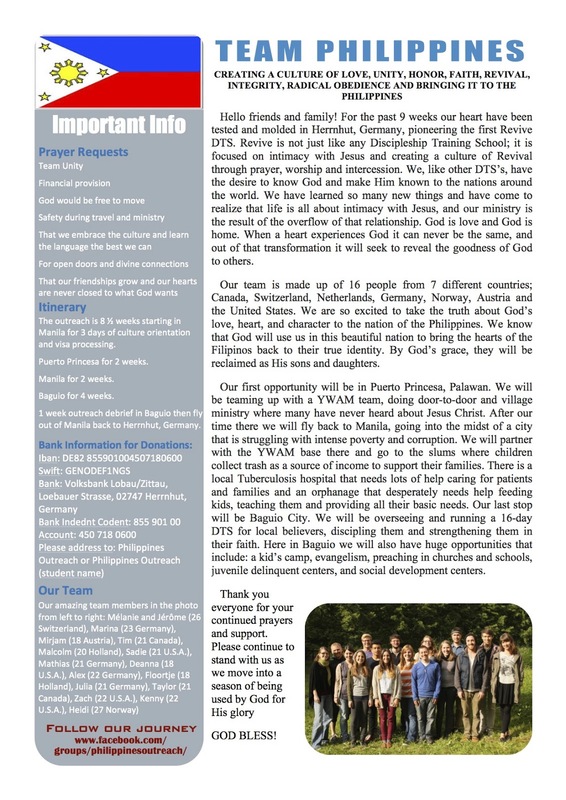 We were able to work alongside the YWAM base in Puerto Princesa with some of the most amazing people I have had the opportunity to meet. They are truly living a life of complete dependence on God as their father, knowing His character enough to trust Him as their provider and protector. We were given the privilege of participating in their ministry that they do within the prison here. We stayed with a family for one night who actually lives on the compound itself, and were able to go into the different barracks and share encouraging words, testimonies, preachings, songs, and dramas with the inmates. The people there were filled with so much joy and held on with anticipation to every word we had to say. The Holy Spirit was so in these times, and it was just incredible to see the ways in which God is moving in a place where most people would struggle to find hope. Half of our stay, on the island of Palawan, was spent in the tribes of Ransang. The simplicities of this place were filled with so much of our Creator's beauty. We slept on bamboo mats, ate fruits which we had never heard of before, bathed in a river near by, and lived a week of our lives as they live every day. We visited schools and families within the neighborhood, ran multiple church services and children's programs. A highlight for me was the 6 hour hike (3 hrs each way) we were able to do on one of our days in Ransang. We trekked through rice fields, rivers with waters waist deep, and a beautifully muddy jungle (considering it is the typhoon season here). We arrived at a bamboo hut where about 15 locals gathered to listen to us talk about the goodness of God and how much he loves them. There is nowhere else I would rather have been than right there, in that home, with those people, on this island. We are currently back at the YWAM base in Manila participating in feeding programs and Bible studies within the trash dump community called 'Smokey Mountain.' The people that live in this community earn their living by scavenging through the garbage, searching for items that can be recycled to provide their family a small profit. Some of my best times have been when we've been able to interact with these people; they are so open to visit with us and open up about their lives.When you ask the Lord for His heart for people, be prepared because He will give it to you! And it will wreck you in the best way possible, causing you to do ministry out of a place of compassion and love rather than of duty or obligation. I am so blessed to be able to be here in the Philippines! Many thanks to those of you who have been supporting my time here through finances and or prayer, I would not be able to do the works God has for me without you. 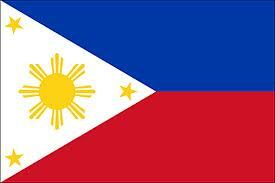 At the end of June, for eight weeks, I will be leading an outreach to the Philippines! It will be myself, one other leader, and fourteen awesome students. This week we will be working more on communicating with contacts there and deciding which ministries we will work with. I am very excited to bring the love of Jesus to the Filipinos and get to know a new culture, considering this will be my first visit. I remember my school outreach and how much those experiences shaped me, so I am quite excited to see what the students will learn from these eight weeks in a foreign country. I will need to raise 1,825 euro before we leave. This will provide me with a flight there & back to Germany, transportation within the country, food / housing, and being able to bless the ministries that we work with. I would really appreciate your prayers, and also your consideration to support this trip financially. I would love to have people who would enjoy partnering with me in what God is doing. Whether you are back in the United States, or in the mission field, it all works hand-in-hand when it comes to the Kingdom of God! Open mic night that the students put on themselves. It was awesome to hand them a microphone and see what came out of it! Week 3, we had a speaker named Mike Vickers who spoke on 'Sin, Repentance, and The Cross.' He walks across countries, carrying a 12ft cross behind him, telling and showing people the love of Jesus. 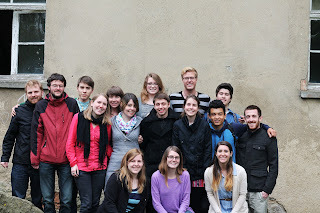 On the last day, he took the school to Dresden (a city an hour and a half away) to evangelize. Amazing stories came out of this afternoon; from healings, to people giving their lives to Jesus. God truly showed up! My lovely housemates! I am incredibly blessed to be living with a group of girls who themselves are seeking after the Kingdom of God. Registration day has come and gone, and we now have 33 incredible, revivalist students! We are anticipating that a few more will arrive this next week as some are still waiting on their visas. We had a long, 4 day, weekend for Easter. So, we as school staff were able to welcome the students to the base and spend their first days getting to know one another, playing games, and having community over mealtimes. The more students I met, the more I felt God give me His love and joy for this school. The excitement and anticipation has only increased! Something else that was really awesome was that the students that were here for Easter Sunday were able to come to our house and join the service. They were able to meet some of the other base staff, celebrate our risen King, and mingle over great food. It was a sweet time of gathering for this special day, and we've already heard from a few of the students how much it impacted them being there. This first week is filled with introductions and just getting settled in. Next week we will begin with the topic, 'The Father Heart of God' with Mike Oman. I can't wait for this week because when we gain a deeper understanding of God as our father, it really transforms the way we think and also opens us up to trust God in whole new ways. Thank you for praying for this school during our preparations. It really couldn't have gone any better! But I would encourage you to continue praying for this Revive DTS! And please, if you have any words or impressions, don't hesitate to send them my way :) That would be super encouraging. One of our staff members, Zach, is in the hospital for Malaria. He hasn't been able to be involved in this first week of the DTS which, I'm sure you could guess, is pretty hard for him. But we know that our Father is the ultimate healer and are praying for complete restoration over his body! Also, we have a student named Harly who is from Indonesia. He finally got his visa and was working on booking his flight to Germany, however all of his money was stolen from him. So, now, we are standing in faith with him that God will provide the finances and quickly! He is still very adamant in coming, so it would be incredible if you would stand with us in prayer for him! We were extremely blessed with a few consecutive days of good vitamin D! And then the snow decided to re-enter our lives. Still beautiful here in Herrnhut nonetheless! We have just three short weeks until the Revive DTS starts, so this week and next we are busy with staff training. 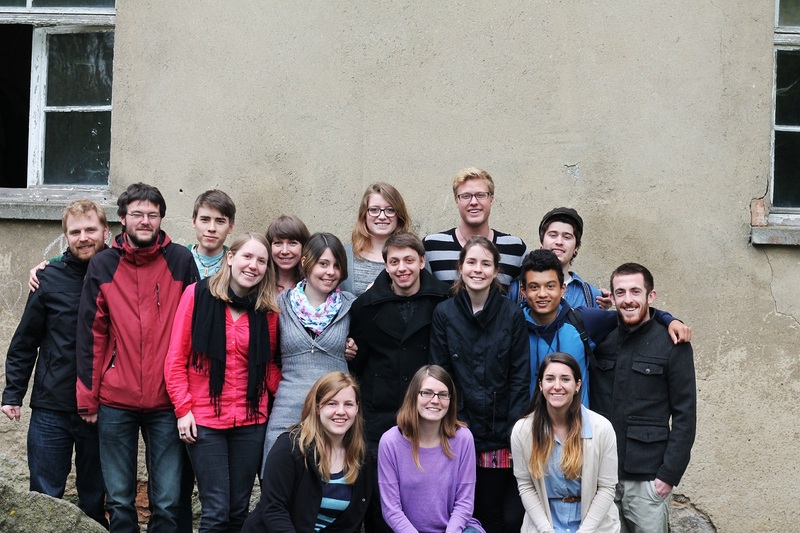 We have a wonderful staff team of ten people and have almost made our goal of 50 students (right now we are at 47)! I can't emphasize enough how much we feel the move of God over this school. One of the main things we can do, is to constantly have a 'yes, Lord' in our spirit because whether or not we jump on board, He is doing something big! John 14:12 NIV - " Very truly I tell you, whoever believes in me will do the works I have been doing, and they will do even greater things than these, because I am going to the Father. " You prayers are changing things! I encourage you to continue to pray big prayers, because we serve a big God.